Even as overall shopper intensity dropped for October, and despite two major recalls for the brand within recent months, Toyota’s shopper intensity remained at an all-time high in the latest report by Dataium. 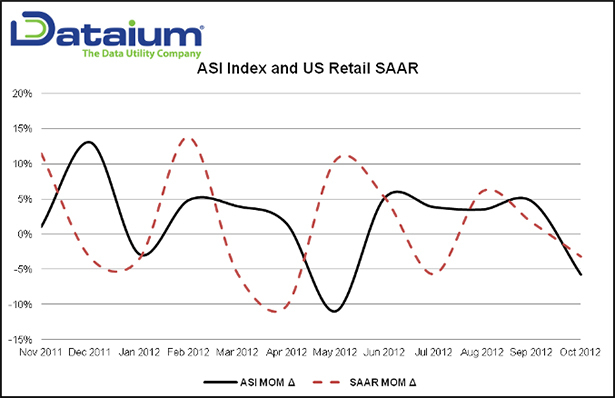 Dataium this week released its monthly Automotive Shopper Intensity report, which illustrates a reversed course in the ASI index for the month of October. The ASI declined 5.78 percent from September, reflecting seasonal trends, the company said. For the Toyota brand, however, shopping intensity remains at an all-time high. The ASI ranked five Toyota models in the top 10 for new vehicles, including the Camry, RAV4, Tacoma, Tundra and Prius. The Camry, gaining a spot from last month, ranked highest in ASI of all new vehicles, Dataium reported. Three luxury imports were among many newcomers introduced to the top 10 ASI ranking list for October. They are the Acura MDX and RDX, and the BMW 328i. The Chevrolet Silverado, meanwhile, saw the largest decline in intensity of all new vehicles in October, falling off the top 10 list after being the top ASI ranked auto for the past three months. The Honda CRV, consistently ranked in the top ten for new vehicles since July, moved up a spot in October to rank fourth. The CRV has consistently outperformed the compact SUV market since June, Dataium said, despite a lack of manufacturer incentives. Dataium’s report is based on data collected from over 20 million active auto shoppers across a diverse network of thousands of automotive websites each month. The national report is available for download at www.dataium.com/library. CNW Research defines an “emotional buyer” as one who buys a used vehicle to fulfill his or her dream of owning that specific model. And according to this month’s Retail Automotive Summary from CNW, this kind of buyer is coming back to the dealership. So, what's behind the resurgence? Now, as the economy continues to recover, the company’s most recent data shows more than 7 percent of user-car shoppers are looking for their dream car. On the other hand, the share of used-car buyers who say they are replacing a vehicle that is no longer reliable is increasing, as well, with 43.75 percent of pre-owned shoppers citing vehicle replacement as their motivation for buying used. “But these trends are fragile and wouldn’t take much of an economic burp to cut the legs out from under the 'wanted one' buyers. It’s an easy purchase to postpone,” said Spinella. However, some of the factors contributing to customer's decisions to buy used are not as easily swayed. Another big factor behind used sales is “change is family condition,” according to CNW, with 25.85 percent of used purchases spurred by this situation. Lastly, children reaching their Sweet 16 adds to used sales rates, as well. Having a new driver in the household accounts for 5.63 percent of used purchases. As part of a branding initiative announced today, vAuto’s used-vehicle inventory management product suite has a new name, and the company has also rolled out a new product line of stand-alone solutions designed to help dealers tackle specific used-car tasks. Explaining the first of the branding initiative’s two components in more detail, vAuto said its current Live Market Suite of inventory management tools will be rebranded to the Provision Suite. “vAuto’s Provision Suite will continue to offer premier, industry-leading solutions that advance the Velocity Method of Management and help dealers manage every aspect of a used vehicle’s lifecycle from an investment perspective,” stated Pollak. The initiative also includes the rollout of the Genius Labs product line, which derives from the vAuto’s purchase of AuctionGenius (which is the first product in Genius Labs lineup). The company used the words “smart,” “simple” and “stand-alone” to describe the products it plans to develop in this product line. Beginning with the “smart” function, vAuto said each product in the line will aim to solve a specific used-car task, be it inventory acquisition or closing a deal with a shopper on the lot. The tools will also utilize vAuto technology and real-time market data, officials said. Lastly, vAuto emphasized Genius Labs products will be similar to AuctionGenius in that they will be stand-alone, “system-agnostic” and customizable for dealers. More Genius Labs announcements are planned in anticipation of the National Auto Dealers Association Convention and Expo later this winter. “We are excited about the potential for the Provision Suite and Genius Labs line to help a broader segment of dealers become more successful in their used-vehicle departments,” Pollak stated. CNW Research said Superstorm Sandy pulled about 250,000 used sales out of the market in October, but many of those buyers have come “roaring” back this month. Analysts project this month’s used sales figure to come in at 3.04 million, which would represent a 17.6-percent jump from November of last year. The prediction is coming with a bright forecast for dealers, as CNW thinks used sales will climb 39 percent at franchised dealerships while inventory turns will spike 41 percent at independent stores. President Art Spinella conceded private-party sales are “taking it on the chin” this month with those transactions expected to be off by 23 percent. Spinella articulated three reasons why dealers’ used sales are projected to strengthen so much in November. “Casual sales are suffering because dealers are becoming increasingly aggressive in selling used cars and are having vehicles shipped into the Northeast from as far away as California to meet the demand,” Spinella said. “Second, many individuals who would sell their cars privately in the Northeast simply lost those cars to Superstorm Sandy and have nothing to sell or had other issues to contend with,” he continued. “Third, dealers are offering some pretty good prices across the country for solid used vehicles as trade-ins to meet the demand,” Spinella went on to say. The year-over-year gain for subprime approvals this month isn't as strong as the jumps were in September or October, but CNW said the climb is still tracking nearly 50 percent higher. Analysts indicated subprime approvals are 44.6 percent higher in November as compared to the same month a year ago. In October, the year-over-year rise came in at 47.8 percent. September's jump was 62.5 percent, according to CNW. Through the first 11 months of this year, CNW discovered more than 7 percent of new-vehicle purchases had a credit card used as part or all of the down payment. This level compares to the previous high-water mark in 2007 when slightly less than 7 percent of acquisitions were put on a credit card. “The real concern, however, is how quickly that debt is paid off,” Spinella said. In 1995, while only 3.4 percent of acquisitions had a credit card-based down payment, CNW noted more than 30 percent of that amount was paid off within 90 days. But the most recent data shows less than 7 percent is paid off within 90 days, only a slight improvement versus 2011 (6.4 percent) and 2010 (5.6 percent). It seems dealers, buyers, and auction owners alikemight be seeing higher values and volumes in the lanes as 2013 gets under way. This week, National Auto Auction Association president-elect Jack Neshe and NAAA president Paul Lips joined Black Book’s Ricky Beggs during his “Beggs on the Used Car Market” video report. After years of low volume and inventory struggles the industry is starting to pick back up, and Beggs asked the pair where they see the market going in the next year. And it seems an increase in repossessed vehicles coming back into the market may help what has been a tight inventory environment for used dealers the past few years. “Unfortunately, delinquencies, we have heard in the news here lately, have hopped up a little bit. I think we will see some rebounds, off-lease vehicles, repos coming back in the market. So, I think in the tail end of my year (2013), we will begin to see some improvement,” Lips said. Beggs also asked the pair how rising volumes will affect wholesale values this coming year. Beggs also touched on the devastation Hurricane Sandy wreaked on the East coast and dealerships in the affected areas. Still-strong wholesale vehicle values resulted in yet another decline for U.S. auto ABS losses, according to the latest index results from Fitch Ratings. Analysts said October auto ABS losses also remained stable as the new model season kicked into gear for vehicle sales. Fitch pointed out the Manheim Used Value Index gained 1 percent, increasing to 121.9 in October from 120.7 in September. "Used-vehicle inventories have remained tight for the past year and a half, post-recession, challenged to meet demand and thus driving up values," analysts said. Prime cumulative net losses continued to drop through October recording the lowest level to date at 0.30 percent, a 6-percent improvement month-over-month from September. This is a 50-percent decline year-over-year as borrower credit quality of newer ABS has improved through the year. Fitch found 60-day delinquencies also dropped for prime auto loans to 0.37 percent for October. This reading is a 23-percent improvement year-over-year and a 5-percent drop month-over-month. "Prime sector delinquencies have stabilized with the U.S. economy showing gradual (albeit protracted) improvement," Fitch said. The firm indicated subprime delinquencies have also remained stable through the second half of this year with negligible movement in levels since June. Analysts determined 60-day subprime delinquencies came in at 3.73 percent in October, a 7 percent increase month-over-month and 20-percent increase year-over-year. Fitch found October annualized net losses improved year-over-year for both prime and subprime sectors while losses ticked up month-over-month. Prime ANL rose to 0.34 percent, marking a 40 drop year-over-year but a 21-percent jump month-over-month. Subprime ANL improved 7 percent year-over-year but deteriorated 14 percent month-over-month. Fitch's auto ABS indices comprise of $62.36 billion of outstanding notes issued from 118 transactions. Of this amount, 76 percent comprise prime auto loan ABS and the remaining 24 percent subprime ABS. "Fitch's outlook for prime auto ABS asset performance heading into 2013 is stable, while ratings performance outlook is positive for prime auto ABS," analysts said.